Your homemade birthday cards can be showcase on this card-making website. It is good to upload them here and add all the materials you used to make the greeting card. Detail in here the steps you took to make the handmade card too an an online record of your creations. Click here to upload your handmade birthday cards and share them with visitors to this website and checkout what others are sharing. Keep an online record of your creation with supplies used and step-by-step explanation of how you made the card. 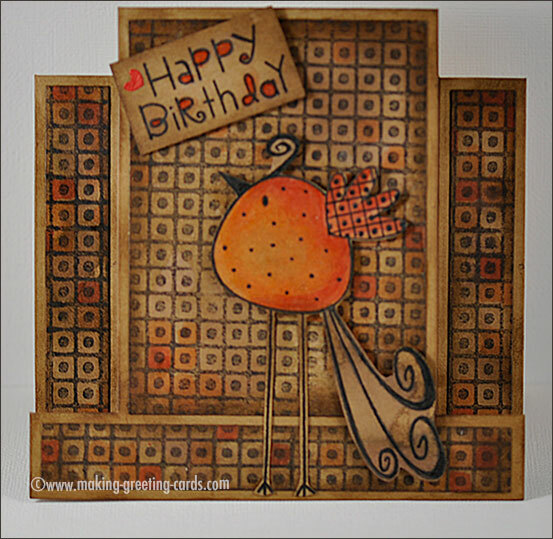 Share your creations with other card-makers whether they are newbies to cardmaking or into this hobby for many years. We love to view cards made by others and be inspired by them. Yes, I'm absolutely sure that a lot of us would love to see your cards and read your story or instructions on how you made the card. For me, I love receiving handmade birthday cards from my creative friends. These are mostly friends from all over the world whom I got to know online. Lately, I'm receiving homemade cards from my local friends too. I look forward to the month of October - that's the month of my birthday. I know that during this month, my mailbox will be flooded with handmade birthday cards. These cards come in white envelopes, cream envelopes, see-thru envelopes, standard and non standard sizes envelopes. Some of the envelopes are even elaborately decorated with handstamped images. It's a good feeling opening these special cards and know how much time and effort was being put into making each of these birthday cards. Inside the envelopes, I usually find cards ranging from simple to really elaborate designs. Some are even delicately embroidered and others hand-stamped, burnt, cut, paste, and embellished with eyelets, glitters, charms and all kinds of cute little trinkets. Wow! Every creation worthy of taking centre-place on top of my chest of drawers where I display all my treasured cards. Have you created a birthday card for someone lately? Like to share it with us? Upload a scan or photo and tell us what steps you took to create it. This is a good place to store a copy of your creation; a record of your work and at the same time sharing the joy of your creation with other crafters online. A description of this birthday card. What you used to make this card: kind of paper, rubber stamp, your own drawing or clip arts, etc. Steps you took to make this handmade card. Be as detail as possible. It will help others and yourself when you look back and wonder; "How did I do that?" Any other ideas or variation you can suggest for our readers. Please be as detail as possible in your explanation so that we can understand better how you make the card. Do also list the manufacturer(s) of rubber stamps, pattern paper, and other supplies you used so that credits are given where necessary. Most Important - Do not forget to upload an image or a series of photographs of the card so we can see your creation. Now, let's do it! :-) Start sharing your homemade birthday cards now. Upload and Share your Happy Birthday cards here. You can upload up to 4 photos here. Click the button and find the image of your card on your computer. Then select it. Note: The maximum image size accepted is 800x600. If your photo is larger than 800x600 pixels, you'll need to resize it before uploading here. card made up of different coloured papers and beads!!! This Invitation card was made for a inter-school match. I punched a hole at the top left side and tied a ribbon to hold the 2 black sheet together. Happy Birthday Daddy! We all love you! Handmade Birthday Card A handmade flower dusted with glitters and paint and ‘WISHES' written with glass lead. A simple yellow homemade card. I made the simple flowers and painted them. Some card stock and scrapbook paper and here it is: - a purple birthday card. My handmade card: 1. Use glitter on star. 2. Add a bow. A Pink Homemade Card I added flowers as I love them. Embellished Birthday Card Made with help of scrap book papers ... and some antique beads. A Homemade Birthday Card - Green Card Made with a simple paper flower and some stickers. A special birthday wish for a special person.. I created this birthday card for my oldest son. He loves motocross. I used all Stampin Up supplies and the brayering technique. this birthday card is for a 10 year old's spa birthday party. I made this card on the occasion of Birthday of my friend. This card is done using Paper Quilling. This pink greeting card is a tri shutter card using handmade flowers which accentuate the pink paper. My Daughter is a unbelievable artist. She is studying at UK to be an art teacher. I need ideas and pictures to make her a birthday card. for my birthday card for my husband. Happy Birfday Le Jacqui !!!! No I didn't, it wasnt me - it was Tosh. No really it was. hee hee! Happy Birthday Le Jacqui !!!! This is a Birthday card for a young lass I work with. Just a card for an old friend. This is my first greeting card I made my own. A lovely vintage birthday card. Pretty ribbon and 3D effect. Open card inside to write what you feel. It's a birthday greeting card made using the paper quilling method. A beautiful handmade birthday card. Well this birthday card was quite easy to make !! I love fairy cards. I made this fairy Christmas card for one of my special friends. Make all the parts separately. Assemble them. Then use creative writing to display. Christmas Cards Note: Do scroll down to add your comment or read comments about Kath's card. The 4th birthday card is made for my sister-in-law's son 4th birthday. Dear Daddy, I want to wish you a Happy 35th Birthday. Happy Birthday card for sister. Here is lovely handcrafed handmade birthday card for special friend. Handbag shaped HAPPY BIRTHDAY CARD. Handle is beaded and glittery stiletto boots added at the corner to complete the girly look. Trying out new stamp. Cute hedgehog card suitable for all occasions.